The saga of the Notion Ink Adam is a tale like many we could name -- it's the story of a tiny company struggling to bring a vision to market, facing friction from investors, factories and the march of time itself. The difference is that the Adam captured the imaginations of gadget fiends like ourselves with ideas that were fantastic from day one and are still novel now that it's finally been released, including a paneled UI, full USB host functionality, and of course that Pixel Qi screen. But does the Adam deliver on the promises of unifying form and function with such technology? In two words: Not really. Update: With a new software update, the Notion Ink Adam is slightly better now. If you asked us, we'd definitely still call it beta, but there's progress being made on the UI front. How would you rate the Adam? At first blush, the Adam's actually a pretty handsome tablet, and it sports a unique design -- whereas most every recent slate is a variation on the original iPad formula, Notion Ink endowed its offspring with a sizable rump that serves a variety of functions. It holds a pair of stereo speakers, one at either end, with the unit's three-cell battery sandwiched in between; it serves as an axis around which the swiveling camera rotates; and it makes for a fantastic grip. 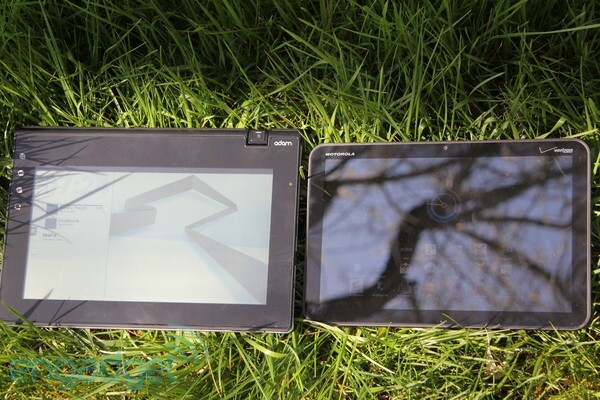 At 1.6 pounds -- the same as the Motorola Xoom -- the Adam isn't quite light enough to prop up with a single hand when lying in bed, but the handle helps quite a bit, and a rubber mesh coating ensured that even when our arms got tired, we never dropped the slate accidentally. The black plastic construction doesn't scream style, but we quite liked that it was matte, keeping us from constantly soiling surfaces with our fingerprints. While we're comparing with the Xoom, it's probably worth mentioning that even though the Adam actually has a slightly smaller 10-inch screen, the rest of the unit completely dwarfs Motorola's slate and most other tablets we've seen. It's not that the Adam is fat -- handle aside, its 14 millimeter girth is comparable to all but the latest batch of skin-and-bones rigs -- but rather that it's got a gigantic bezel surrounding the screen that no amount of photoshopping can hide. The upper-left-hand corner of the bezel is where you'll find the Adam's four capacitive touch buttons, which are a disappointment in and of themselves. They're not backlit, provide no vibrating feedback, and are in a position where it's easy to brush them with stray gestures. We aren't completely sold on Google's virtual buttons in Honeycomb, which are always positioned at the bottom left corner of the screen, but at least we can use them in the dark and live without fear of exiting apps and canceling commands accidentally. 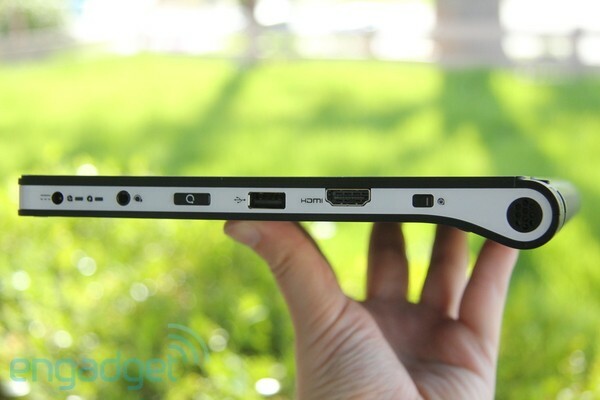 Underneath that bezel, however, there's something fantastic going on -- rival manufacturers take note -- enough full-sized ports crammed into that creamy white band to make the tablet into a potential laptop alternative. There's a lot of fuss about connecting tablets to keyboards and televisions as of late, but the Adam doesn't need a proprietary keyboard, cables or docks because it's got two full-sized USB ports and a full-sized HDMI slot. It detects USB peripherals automatically and seamlessly, as we discovered when we plugged in our wireless Logitech mouse and keyboard using their Nano receivers and had both work like a charm, and the Adam can do full 1080p display mirroring over that HDMI port. Unfortunately, the HDMI connection doesn't pass audio signals and may not line up the mouse cursor with the television properly (unless you've got a 1:1 pixel mapping option) so it's not quite the leanback experience we'd hoped, but we were definitely able to draft some business emails and browse the web without ever touching the screen. 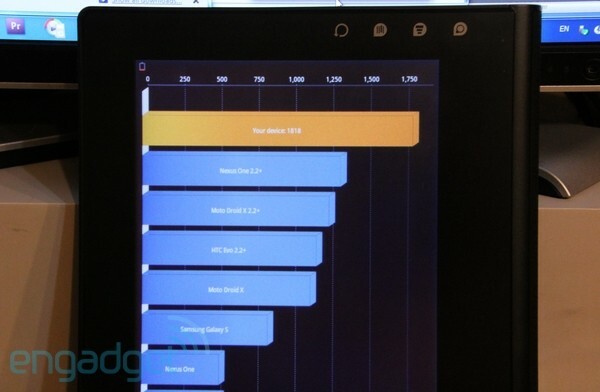 And considering how many issues we had with that 10-inch, 1024 x 600 screen, it's probably just as well. Since the very first time we caught wind of the Notion Ink Adam on one cold December morn, its claim to fame was this -- it would be the first mass-market device to ship with a Pixel Qi screen, and a matte one at that. We've never been shy about professing our love for fingerprint- and glare-resistant surfaces, and we've long been fans of Pixel Qi's 3Qi display, a special dual-mode LCD which allows you to switch off the backlight and use the sun's rays to illuminate your images instead -- and we were particularly impressed to find that Notion Ink would be using Pixel Qi's wider viewing angle displays. We're sorry to say that two of these promises simply weren't fulfilled. Not only do you have to affix an (included) screen protector to achieve the matte effect, but the Adam's viewing angles are terrible. Approach it from any angle but head-on and either the whites or blacks wash out, and if you tilt it to the left everything begins to turn a sickly yellow. The colors are also a bit washed out, and if you're a fan of deep, inky blacks you'd best look somewhere else, as the best the Adam can do is a shade of noisy purple. Moreover, the matte screen protector is fairly thick and we suspect it may be to blame for making the tablet's capacitive digitizer less effective than it should be, as it often felt like we had to press with a little bit of effort to get the Adam to respond to our touch. All that said, the Pixel Qi's reflective mode most certainly does work, and it does its job well, saving hours of additional battery life and making the screen quite viewable outdoors. The question is whether that's worth all the other tradeoffs. Technically, the Adam runs a build of Android 2.2 (that's Froyo to you dessert lovers) but you'd be hard-pressed to determine that, as Notion Ink's skinned the entire thing with a user interface it calls Eden. The Eden UI is actually composed of a number of innovative concepts, like the Panel View you can see in the picture above, which eschews the standard icon-filled homescreen in favor of a series of miniaturized apps that you can scroll through. The effect is like having multiple Android phone apps open at the same time and on the same screen, putting a mobile browser, calendar, email and the like at your fingertips -- as well as controls for the Android media player and shortcuts to the last eight apps you've used. You open apps by activating a red ribbon which stretches horizontally across the screen, and you can narrow down choices quickly by tapping the first letter or two of the name you're looking for into the virtual keyboard -- which isn't bad, by the way, with fun typewriter clacks when you click and a set of dedicated arrow keys. If you'd rather see all your apps at once, there's also a standard homescreen where they're all stored, which you can access by tapping the clock. 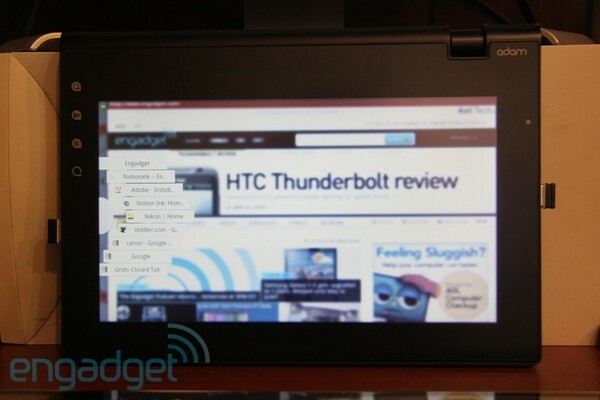 Drag and drop an app from the ribbon onto the desktop and the Adam will attempt to open it in Panel View. Sadly, you can't just turn any app you want into a Panel, only the ones that Notion Ink specifically includes, and as of today those are precious few -- not to mention that those that come with the Adam are buggy and frustrating as a general rule. The interface is also slow to scroll, often unresponsive, and not every part responds the same way to Android's hardware buttons. 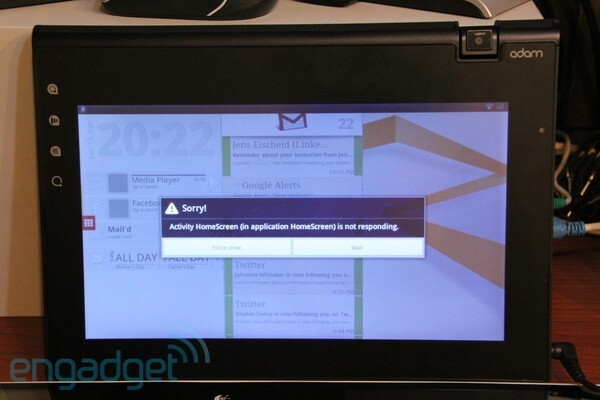 We also had some very odd issues when the tablet went to sleep -- sometimes, it refused to wake up without rebooting, and once it spontaneously reset the internal clock to January 1st, 2009. Oh, and on occasion when the UI was acting unresponsive, the entire tablet would crash to a black screen and reboot spontaneously. Not good. Let's take a few of Notion Ink's bundled apps for a spin, shall we? Browser: Notion Ink's tabbed Webkit browser looks and feels great at first, and loads pages fast -- full desktop webpages, mind you, not the mobile versions that Motorola's Xoom defaults to. It sports snappy inertial scrolling, has a host of shortcuts for bookmarks, text selection and screengrabs, and there's a nifty virtual thumbwheel that lets you add, kill, and swap between tabs. Assuming you have the APK handy, it'll even do Flash. Unfortunately, it's alo not quite stable enough for us to trust it with critical browsing sessions -- a number of times we returned to the browser, and found it had forgotten all our tabs, and on occasion we encountered an outright crash. What's more, there's actually a foolproof way to ensure it crashes: just click on that fancy tab wheel a few times in a row, and you'll be greeted with the Force Close dance. The panel view is rather disappointing, too, as though it does keep a simple list of the full browser's active tabs, you can't actually view any of them in the miniature. Mail'd: There's no Gmail here, but Notion Ink provides an alternative -- Mail'd, an IMAP / POP3 client (reportedly based on the popular K-9 Mail for Android) that can automatically set up an IMAP version of Gmail with just your email address and password -- though we had quite a bit of trouble getting the setup screen to recognize user input. It's got a fairly useful two-panel tablet layout for browsing and reading email, and a full-screen view as well, but in most every way it's a far cry from Google's Honeycomb Gmail client. Again, the Panel view doesn't automatically sync with what you're doing in the full app, and doesn't automatically update the miniature inbox it provides. Sniffer: A quick, attractive and intuitive three-panel file manager, Sniffer lets you browse the contents of the Adam's internal storage, microSD card and any attached USB drives, and copy, move, delete, rename, preview, play and search for files. There's also a basic task manager included, and the Panel View is fairly nice, giving access to the full functionality one panel at a time, though once again, it won't keep track of where you were in the fullscreen version. Calendar: An attractive full-screen or single Panel calendar that kind of misses the point -- it doesn't import or export events to or from any existing calendar software you might use, so you'll be entering every event by hand and referencing them exclusively on the Adam. Update: If you dive into the Adam's settings menu, there is indeed a way to sync an Exchange account. Canvas: This one's a fairly interesting -- if pretty basic -- fullscreen painting and photo editing app, which lets you composite three layers at a time, with a full color picker for four custom hues and control over opacity and brush size. There's also eraser, bucket and text tools and a variety of photo filters and tweaks you can access by dropping into edit mode. Calculator: Notion Ink's built a hefty scientific calculator here which processes multiple functions in a row, and has a virtual tape output so you can keep track of the history. Shrink it down to Panel View and it becomes your standard calculator. Facebook: This isn't a full-screen app, but rather the mobile version of Facebook's website in a Panel view, along with a notifications bar that theoretically pings the Facebook servers to pull in your social feed automatically. That'd be nice, because the mobile website doesn't ever refresh itself, but we say theoretically because we couldn't actually get notifications to work. So that's just what we did -- we grabbed the Amazon Appstore, SlideME and a batch of APKs from our handy Froyo phone and put them to work on the Adam. That dual-core 1GHz Tegra 250 actually makes for a fairly potent device, as we discovered in a number of tests, with the Adam scoring between 1,700 and 2,100 in Quadrant, calculating 37 MFLOPS in Linpack, achieving 42.6fps in Nenamark, and speedily playing a variety of Android games, whenever the Adam decided it was in a good mood and let them run without crashing. We also sideloaded Flash 10.2 onto the Adam, and it runs in the browser fairly well, though individual videos felt like they took a tad longer to load. 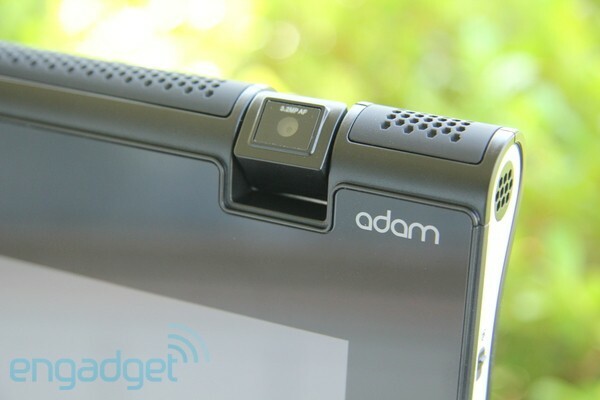 Interestingly enough, the Adam's sensor package performed far more quickly than many other tablets we've used, getting us a super-speedy GPS lock in maps, and nigh-instantly rotating the screen when we shifted the Adam's orientation. We're not big fans of the stereo speakers, however. Two are certainly better than one, and their audio is mildly clear, but they have so little bass that the only thing they'll rattle is the confidence in your purchase. We mentioned earlier that the Pixel Qi screen extends the Adam's battery life, but it's still not as good as we were led to believe: if you were hoping for the minimum 15 hours battery life that Notion Ink promised, you'll have to look elsewhere. We did manage to make it through a full 24-hour day with very mild use and found it just about ready to die when we woke up the next morn, but in our standard battery rundown test (which loops the same video, with WiFi turned on, and the screen at roughly 65 percent brightness) the Adam managed only 8 hours, 38 minutes with the backlight off. Using the Pixel Qi's full color LCD, we managed only 5 hours, 52 minutes before that 24Wh battery died. 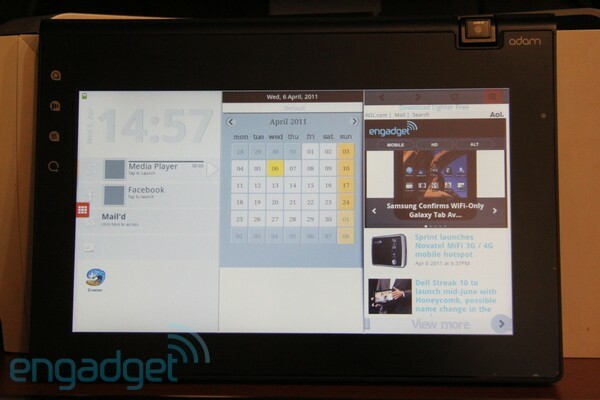 Mind you, that's comparable to the original Galaxy Tab, but decidedly weak for a 10-incher. The 3.2 megapixel camera attached to the Adam has one neat trick -- it swivels to swap between front- and rear-facing orientations, and it automatically flips the image when it detects which way is up. However, it also smacks of being very, very cheap, both in terms of the noisy, overexposed images it produces and the general flimsy build quality. There's also the little matter of an exceptionally annoying autofocus issue. When you launch the camera, it will attempt to autofocus several times in a row (with absolutely no prompting from you) and if you try to take a photo without waiting for it to finish, you'll add a hefty layer of blur on top of the noise and extraneous light. Not a delicious sandwich, we assure you. Notion Ink truly did come up with a number of fantastic ideas for the Adam tablet. They do show. But so little of their light shines through the muck of buggy software and touchy hardware that we're afraid even the best of them will be completely dismissed and ignored. If Notion Ink had delivered on its promises of a miniature touchscreen office where full Android apps run side by side in perfect harmony and multitask with ease, we'd award it high marks -- all current tablets claim to enable productivity, but most settle to be simple entertainment consoles. Even Google's Honeycomb OS still struggles to find a way to unify the worlds of tablet and phone, and Notion Ink's prototype shows a way it could be done. 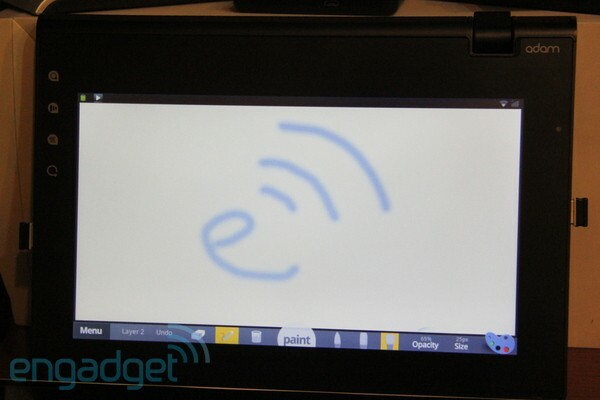 Features like USB host functionality, a desktop-class web browser, a sunlight-readable screen and a multitask-friendly interface aren't just value-add bullet points that justify a higher price -- they're the difference between a tablet that can augment an existing computer, and one that can replace it altogether and thrust users into a new paradigm. We're sad to see the Adam couldn't make it happen, but there's still an opportunity for other manufacturers to take up the torch. Update: According to Notion Ink the Calendar app can sync, but you need to manually add your account information in to make it happen. We're working on verifying this.